WHAT: The Joshua Show by Joshua Holden of New York, N.Y. When Mr. Nicholas, the sock puppet, makes an unnerving self-discovery that makes him sad, his soul mate Joshua teaches him to celebrate his differences in this quirky show full of songs, comedy, whimsy, abundant joy and just a smattering of tap dancing. This heartwarming story about friendship, confidence and the value of being yourself will resonate with children and adults alike. Click here to see a trailer. Hailed as "The Ambassador of Joy" and "A Hipster Mr. Rogers," Joshua Holden is an award-winning puppeteer known for spreading joy through dance, music and vaudeville humor. 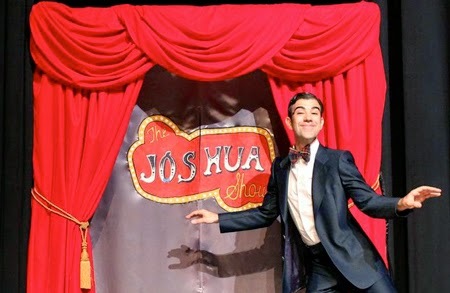 The Joshua Show was awarded Best Performance and voted Fan Favorite at the 2013 Puppeteers of America’s National Festival. To learn more about Joshua Holden, click here. Tickets include the performance, museum admission and the Create-A-Puppet Workshop (or To-Go Kit) where visitors can make their own Swift Snail rod puppet to take home! WHEN: March 17-22, 2015 – ONE WEEK ONLY! HOW: Tickets for patrons ages 2 and older are $9.25 (Members) and $16.50 (Nonmembers); group rates are available. BUY TICKETS AT WWW.PUPPET.ORG OR CALL 404-873-3391. For more information, call 404-873-3391 or visit http://puppet.org/perform/joshuashow.shtml.